Face Cosmetic Surgery Toronto - Face Toronto specializes in rhinoplasty, facelift surgery, facial plastic, dimple surgery and reconstructive procedures. 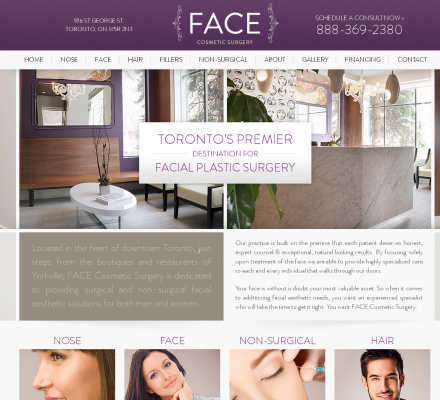 Face Toronto specializes in rhinoplasty, facelift surgery, facial plastic, dimple surgery and reconstructive procedures. Our cosmetic surgery clinic is located at Bloor and St. George. Face Toronto offers rhinoplasty plastic surgery, cosmetic surgery, facelift surgery and Hair restoration which help you look younger, well balanced and attractive. Description: Face Toronto offers rhinoplasty plastic surgery, cosmetic surgery, facelift surgery and Hair restoration which help you look younger, well balanced and attractive.